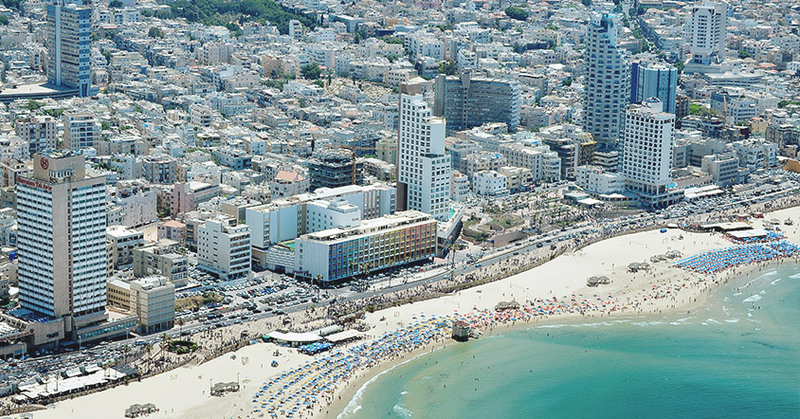 When seen from above, Tel Aviv takes on a different personality. The relatively small metropolis, bursting with people, honking cars and a sort of dreamy chaos at street level, has the appearance of a deeply ordered and organised city from above. Both perspectives however shine a light on the beautiful old Arab buildings that sit beside the Bauhaus ones, and some of the city’s great anomalies. Our rooftop cannot be missed for simply stunning views in one of the city’s most important neighborhoods for architecture & history. The sea, the old nestled in comfortably amongst the new and the famous Water Tower, this is the perfect spot to take it all in. Dinings restaurant serves up exquisite food on a terrace that will melt you. The three towers are occupied by offices, a big shopping mall and a hotel, but on the 49th floor of the circle shaped building is the Observation Floor, open to the public every day except Monday, and offers a breathtaking view of Tel Aviv from 187 meters above (614 feet). In the heart of Tel Aviv, Dizengoff Center was the first shopping mall of the city built in 1983, and since then it is a source of some contention. Whatever your view on the Dizengoff Center, on its upper floor there is an indoor pool and from its terrace an exciting view of Tel Aviv can be enjoyed from one of the city’s iconic structures. This postmodern granite and ceramics building we see today replaced the original Tel Aviv Opera House. Inside The Opera Tower of today, there is a fitness center, a small mall and a cinema, while the upper floors are devoted to private apartments. A private swimming pool is on the top of the tower’s platform and from there it is possible to watch the sunset over Tel Aviv.